The second season of Nicholas Tse’s (謝霆鋒) reality cooking show Chef Nic <十二道鋒味> will air its last episode across broadcast platforms on Saturday evening. 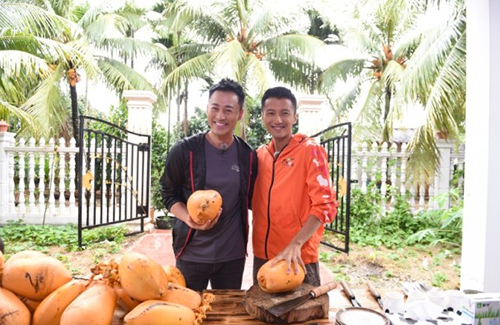 In this final episode, Nicholas invited Raymond Lam (林峯) as a special guest to help him cook the legendary Hainan dish, the Dongshan goat with coconut. The team traveled to the island of Hainan to go on a risk-taking adventure to collect cooking ingredients. Although Raymond claimed that he has never really cooked in his life, the actor showed his natural cooking talent while preparing the meaty Hainan dish. He was very handy with the kitchen knife and showed some familiarity with the frying wok. Raymond clarified that he is often given the task of chopping up vegetables at home. However, he has never fried food with a wok before. Some cast members were also given the challenge to submerge in the ocean to search for more ingredients underwater. When William Chan (陳偉霆) received his challenge, he said, “I didn’t want to do it at first. I tried to train my breathing technique in a swimming pool that was 1.5 meters deep, but I couldn’t handle it in the end.” However, William ultimately agreed to do it; he said it’s time to overcome his fear. The final episode of Chef Nic will be airing on Zhejiang TV on October 23. It will be available for streaming on online broadcasting platforms such as LeTV and iQIYI.